My introduction to the cable cars of San Francisco came in the year 1954 when I was a navy trainee stationed on Treasure Island for a few months. Most weekends I took the train from the Yerba Buena station on the island and rode across the Bay Bridge into the city. The cable cars were the best way to get up and over the hills, and the Powell St. cable was my favorite. It went up Knob Hill then as it does today. My camera at that time was an Argus C3 that I bought at the Navy Post Exchange in San Diego. A few of my photos taken while in the USN have survived the years. 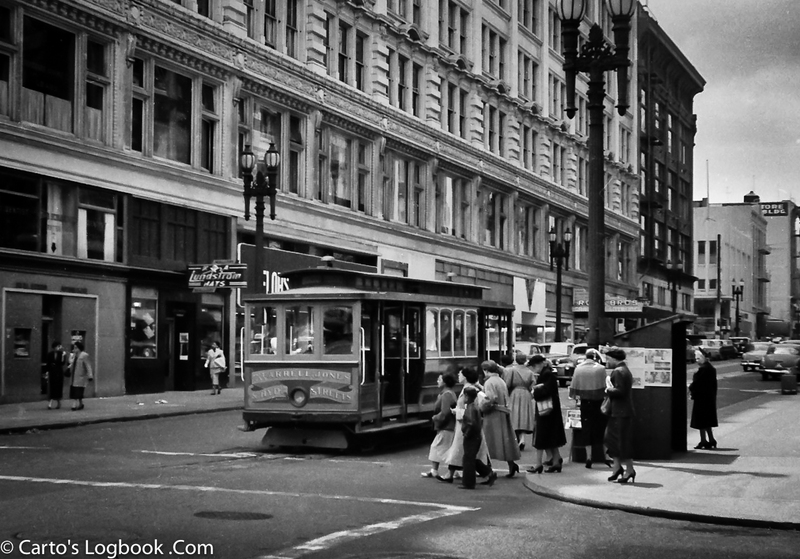 Among them are the cable car shots and these photos of downtown San Francisco. The tradition continues — I must go up to the city and take a new shot. Until then there is the Cable Car Museum on-line. WordPress bloggers are posting entries for this challenge, here. You’re welcome to browse the results or add your own entry. This entry was posted in San Francisco, Travel Blog, weekly Photo Challenge and tagged Cable Car, Lightroom, Photography by carto. Bookmark the permalink. Serious nostalgia! I remember the first time I rode one as a little girl visiting San Francisco in the late 50’s. It was so exciting.